Blend the lemongrass, galangal & ginger. Mix all the ingredients well (except the oil) and marinate chicken for at least 20 mins or better overnight. Heat oil in a wok and deep fry the chicken for about 15-20 mins on medium heat until golden brown and fully cooked (as chicken drumsticks may take longer to cook, please ensure you check inside to see if it’s well done). Remove the fried spiced crumbs from the oil and set aside to drain off excess oil. 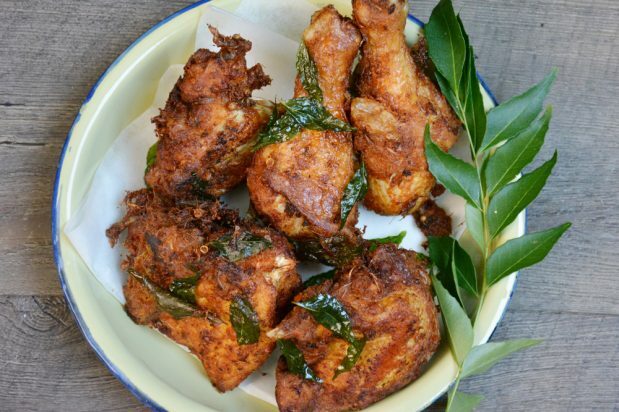 Serve hot and garnish with the fried curry leaves and crispy fried crumbs for extra flavour.